• Superior alternative to conventional hay feeding methods. • Saves money — design minimizes hay waste and loss. • Unique design captures smaller pieces of hay in the bottom, where they are eventually consumed. • Because hay stays off ground and in the Hay Feeder, there is less mixing of hay with bedding and manure, facilitating stall cleaning. 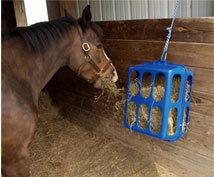 • Integral handles make it very easy to lift, carry and hang — wherever you feed hay to horses. • Easy to refill — even while hanging in stall, paddock, trailer or picket line. • Adjustable hanging position encourages natural neck grazing position and maximizes respiratory health. • Keeps hay off of the ground, reducing the incidence of sand colic. • Slows consumption with smaller bites; Nature’s way of improving digestion. • More convenient than ever to soak hay — Load, dunk and drain! • Hay accessible from all 4 sides; works as a great boredom buster! • Suitable for all grazing animals. • Smooth, 4” rounded oval portals are made smaller than a 00 horse shoe/hoof; safer for all sizes and shapes of animals! • Will not collapse, wrap around, entangle or cut animals. • Hay portals are designed to be muzzle friendly! Smooth, rounded, thicker edges prevent cuts or irritation. to animals’ skin; thicker edges also prevent Hay Feeder from getting wedged between horse’s shoe and hoof. • FDA Food Contact Safe recyclable plastic withstands extreme temperature flux and heavy horse abuse. • Will not mold or rot and is easy to keep clean — just wipe down or hose off! • In some instances, bales of hay are bundled as 30" flakes (3 string bales) instead of the standard 20" flakes (2 string bales) . These bales can be identified by the need to use 3 strings to hold them together instead of the standard 2 strings. These 30" flakes do not fit in the HealthEz Hay Feeder very well. We suggest the use of the standard 20" bale flakes of hay for our feeder . • The Health E-Z™ Hay Feeder is manufactured in the USA.